"Chalotte" 2014 Acrylic on canvas. 14"x18" Sold. Prints available. "Asliani" 2014 (Medicina album artwork) Acrylic on canvas. 14"x15" Sold. Prints available. "Tree Goddess" 2011 Acrylic on canvas. 3.5' x 6' Original for sale $2500 Prints available. "Staff of Asclepios" 2014 Colored pencil on black paper. 12"x12" Sold. Prints and stickers available. "Faith's Flower" 2014 Colored pencil on black paper. 12"x12" Sold. Prints and stickers available. 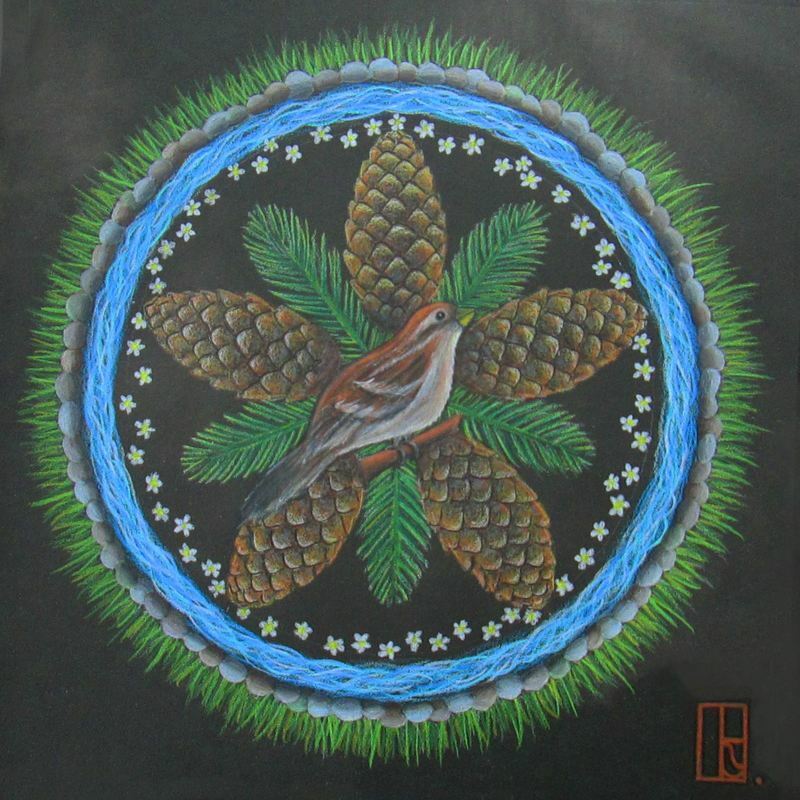 "Jack's Mandala" 2013 Colored pencil on black paper. 12"x12" Sold. Prints available. "Rainbow Goddess" 2013 Colored pencil on black paper. 12"x12" Sold. Prints available. 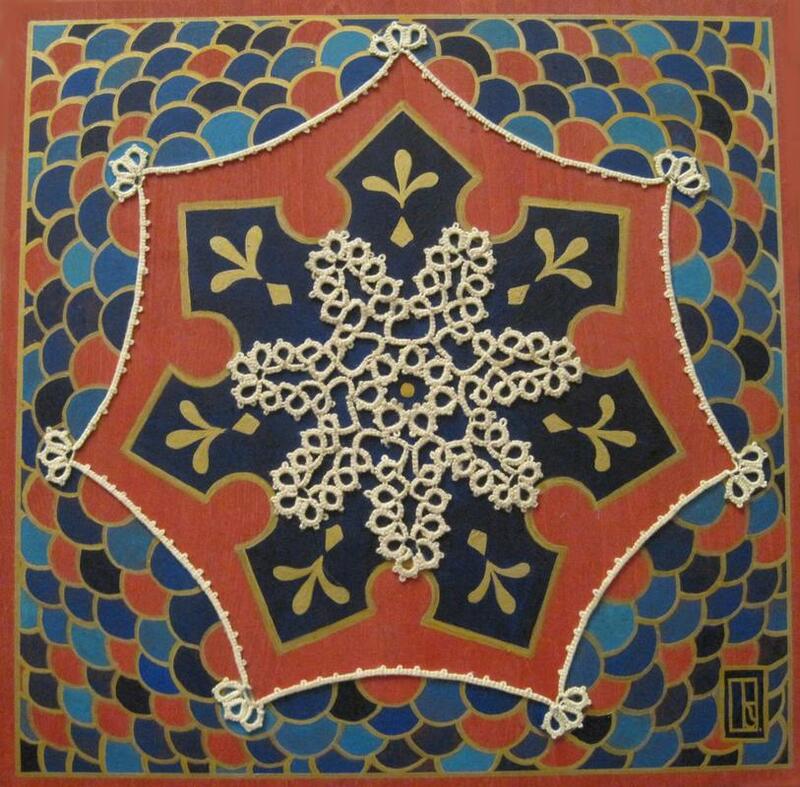 "Tatty Mandala" 2011 Tatted lace, wood stain and acrylic on wood. 10"x10" Sold. "Light Now" 2011 Acrylic on canvas. 14"x16" Original for sale $777. Prints and stickers available. 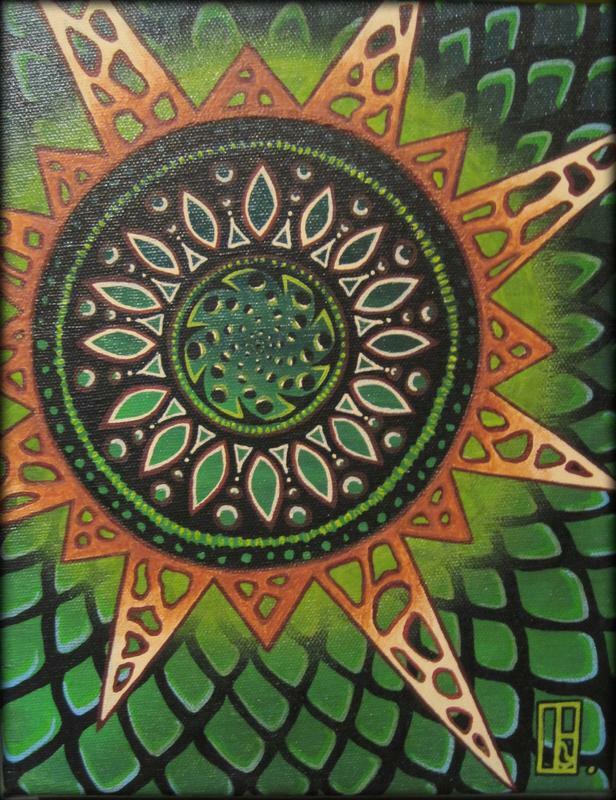 "Gaia's Invitation" 2011 Acrylic on canvas. 10"x13" Sold. Prints available. 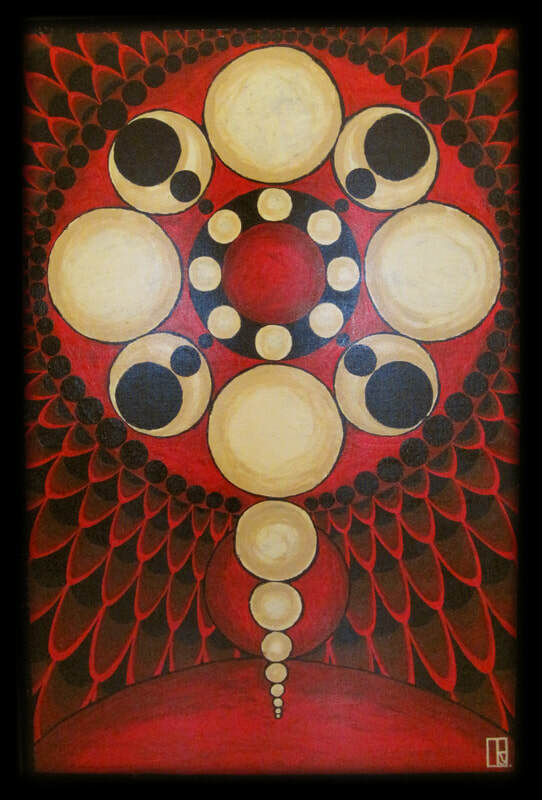 "Concepto Rojo" 2010 Acrylic on wood. 2.5'x4' Sold. Prints available. 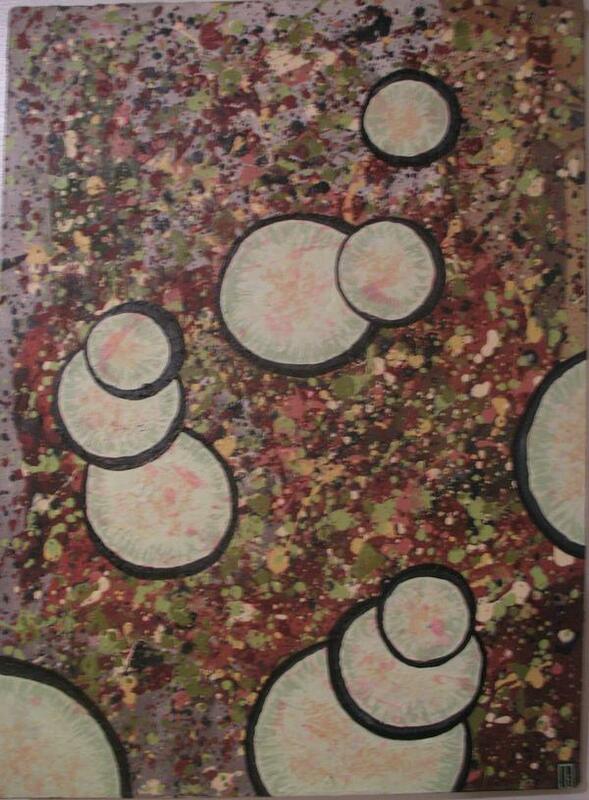 "East Meets West" 2009 Acrylic on recycled painted collaged canvas.6.5'x6' Original for sale $1111 Prints available. 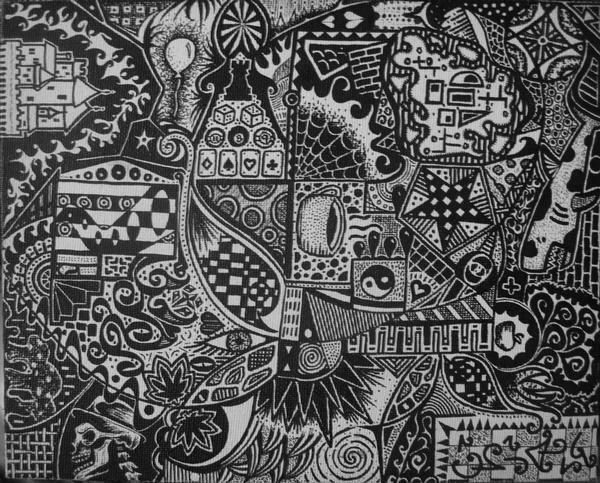 "Aquarius" 2009 Acrylic on canvas. Original available $2222 Prints & stickers available. "Gita, Goddess of Song" 2009 Acrylic on canvas. Sold. Prints available. 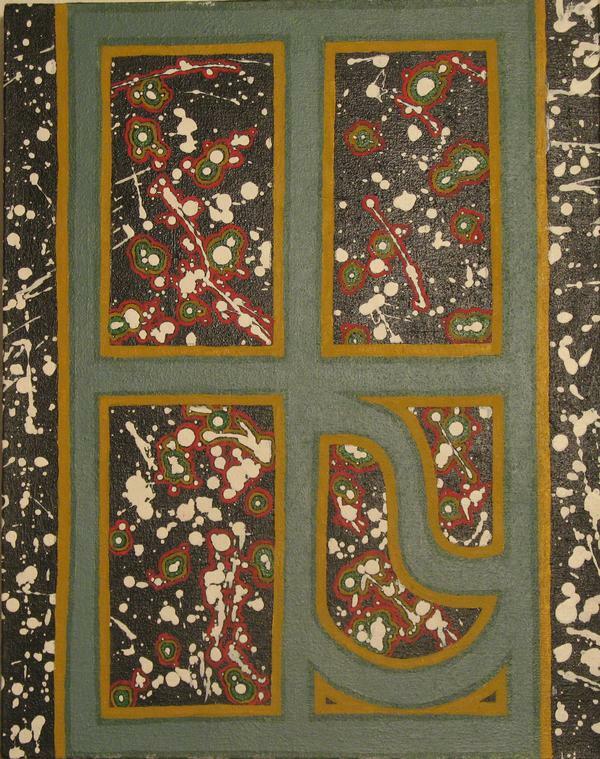 "Bridgine Heaven & Earth" 2008 Acrylic on handmade paper. Sold. Made for the television show "Briging Heaven & Earth" Prints and stickers available. "Avesa / Hail to the Infinite Unknown" 2007 Colored pencil on paper. Original gifted to the Temple of Self Ascension www.sriandkira.com Prints and postcards available. 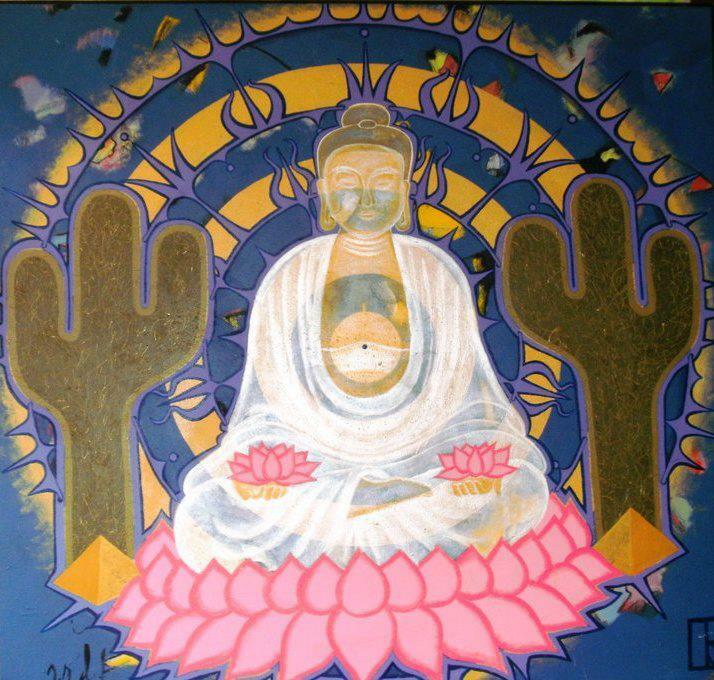 "Father Mandala" 2008 Acrylic on paper. Original made for my father. Prints available. 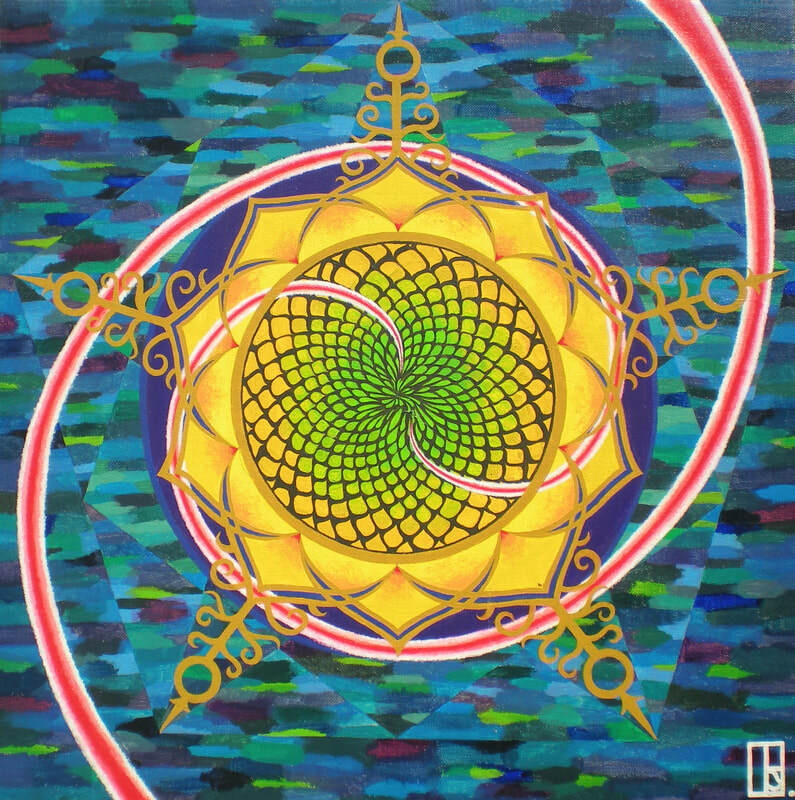 "Mother Mandala" 2008 Acrylic on paper. Painted for my mother. 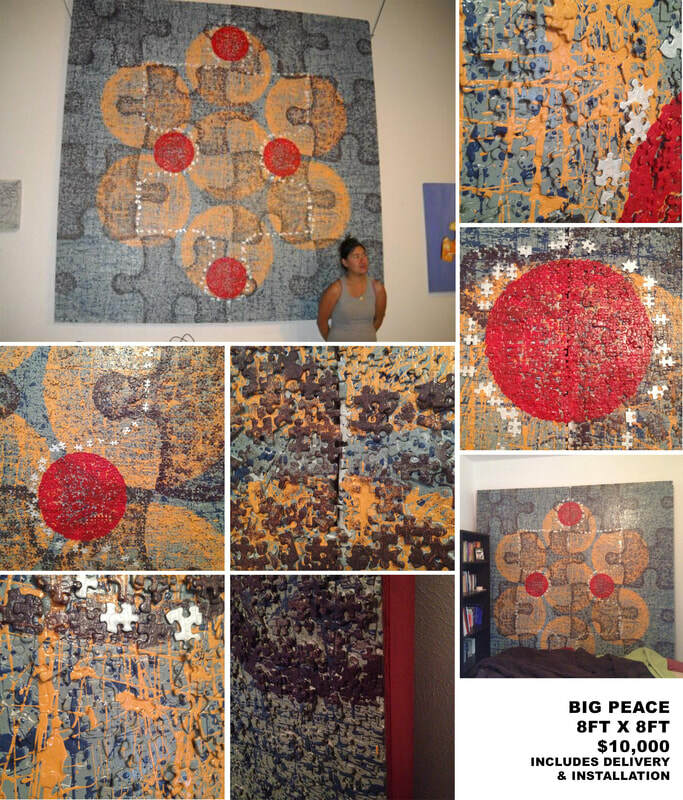 "The Big Peace" 2008 A collaboration with artist Kae Sumrall using over 65,000 jigsaw puzzle pieces adhered to 8' x 8' particle board and painted with latex paints by Ramona Teo. Original available for purchase and is in need of a new home -temporary or permanent! 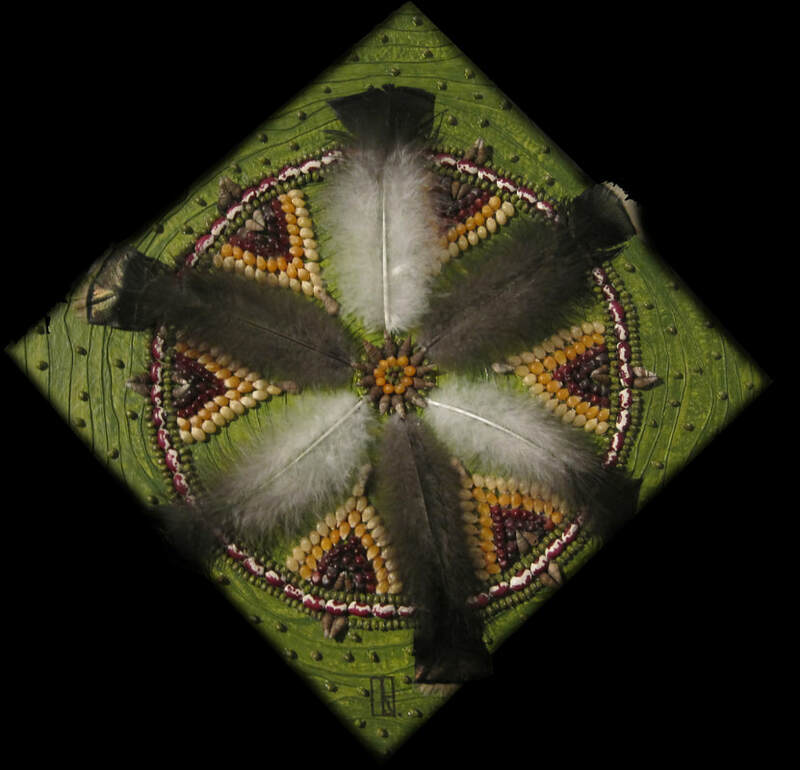 Contact ramona@divinenaturearts.com To learn about the creation of this piece and others in the series, watch http://www.youtube.com/watch?v=Y3nfJ_SpJiQ Original for sale: $10,000 ​includes delivery & installation. 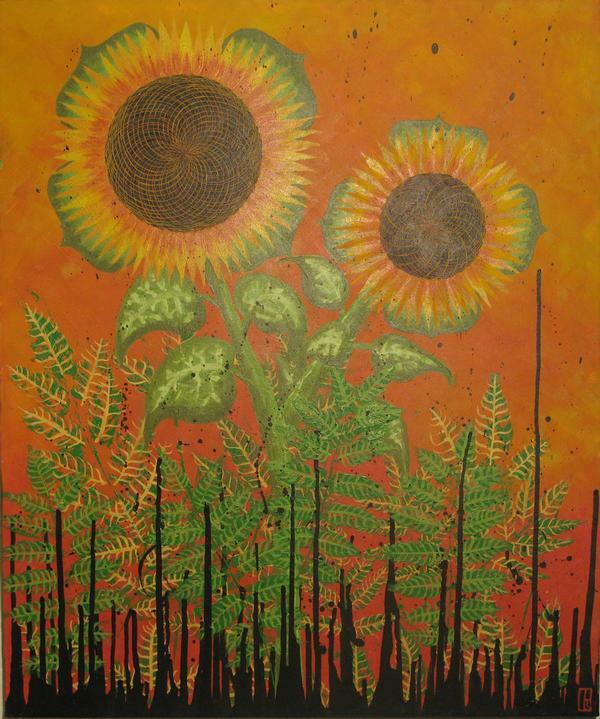 "Sunflowers" 2007 Acrylic on canvas. Sold. Prints available. "Strength" 2007 Acrylic on canvas. "Beans & Eggplant" 2007 Acrylic on canvas. Original for sale $222. Click on the picture to watch a creative YouTube video of me creating this piece!